"I use photography to deconstruct urban spaces and to play with our perception of reality. I use a multiple exposure approach to create a moment of confusion, but also to convey a sense of calmness in the chaos, and to transfer the scene into a transitional world between reality and dream." Daria Martinoni is an amateur photographer working and living in Zurich, Switzerland. As a Geographer, she uses photography to playfully (de)construct the built urban environment we live in, in order to explore our perception of space (and reality). She experiments with long shutter speeds and several zoom settings in one exposure. With this approach, she aims at questioning our making of the world through experience and knowledge. Her photography "Swissmill Tower" has been awarded an Honorable Mention in the 2018 International Photography Awards (@photoawards, @iphotoawards). She has been accepted to the photoSchweiz 19 (www.photo-schweiz.ch), which is the largest photography exhibition in Switzerland. Each year the retrospective provides a representative overview of the past year in Switzerland from a photographic perspective. "I have learned to appreciate the little things that define the worlds and experiences of others -- from being a photographer to living and creating art. In this, I strive to capture the true passion of living the moment and those little things which signal what is so special…"
After retirement from a successful career in the ICT world, August quickly discovered his immense passion for artistic photography, digital art and low-key and grunge photography. Therefore, it was no surprise when he joined the various training programmes of the “father of digital art,” the famous Sebastian Michaels based in Arizona (USA) who has influenced the artwork of August to a large extent. August also graduated at the New York Institute of Photography with distinction, specializing in Intense Portrait Photography. August almost got molded in record time, becoming a master in low-key studio work, grunge photo art as well as full blast digital art and artistic photography. His work has been published in over 30 international publications all over the globe of which the latest was a full-blown biography of him in the Austrian based Fine Eye Magazine. During his artistic journey, August participated (and is still participating) in various group exhibitions and he has received numerous honorary mentions and international prizes for his work. He was invited by Eikon Culture Visual Reflections, being the only South African between artists of over 70 countries to participate in three international exhibitions in Italy. During 2017 to 2019, August has been exhibiting at the Heaven Art Gallery which was based in Arizona and he is still exhibiting at the Blank Wall Gallery, in Athens, Orenda Gallery in Nevada as well as various online exhibitions like Fusion Art Gallery. His work is on display and is accessible internationally. August’s exhibition at Fusion Art during August 2018 walked away with Best in Show in the 3rd Artist's Choice International Juried Art Exhibition. Photography and the creation of art is not a job for August. It is rather living an artistic life which he is extremely passionate about. Coast, Highway 101 - Digital photograph 24 x 36 in. "I took my first photographs as a young child growing up in Coronado, a seaside town near San Diego, California, with a Kodak Brownie Hawkeye my father gave me. His enthusiasm for photography inspired me. I am particularly interested in macro photography and in capturing overlooked details and exploring miniature worlds hidden in ordinary objects, and in the relationship of color, light, shadow, form, perception, and imagination. My abstract photography captures forms of water and variations of light, all interacting with glass. Each image provides an unrepeatable glimpse of water at the macro level, its forms, natural patterns, and chance combinations that constantly change during the process of capturing the image. The images are titled, but they are open to interpretation by viewers, guided by their own intuition, perceptions, experiences, and memories. The images invite an interaction between the image and the imagination of the viewer. The photographer sees one thing in these abstract images. What do you see?" Woodblock Storm - Digital photograph 24 x 36 in. Shoreline Reflections - Digital photograph 24 x 36 in. Lake View - Digital photograph 24 x 36 in. Ocean Horizon - Digital photograph 36 x 24 in. American photographer, Priscilla Dale Jones earned her Ph.D. at University of Cambridge, United Kingdom and holds a Master’s Degree from the University of California at Los Angeles (UCLA) and a Bachelor's degree from San Diego State University, San Diego, California. Today she lives and works in Columbia, Maryland, USA. "I paint what I feel strongly about. My mottos are: 'Less is more' (Anonymous), 'It takes a long time to become young.' (Picasso) and 'Do ordinary things with extraordinary love.' (Mother Theresa) ." Water Lilies Pond - Digital media 60 x 45 in. Born in Vietnam and living in the USA, John Trinh graduated from the Art Center College of Design in Pasadena, California. While studying at the Art Center, he won "Artist of Distinction” award from the National Alliance for Excellence in New York. Since graduation, he has worked for major companies in the field of art and design such as Mattel, as a Senior Visual Designer, and Disney as a Digital Artist. Trinh's work was featured in International Contemporary Masters art books (2010 and 2011) and has two paintings as a part of the permanent collection of the Southern Nevada Museum of Fine Art, Las Vegas. Most recently, he received the Circle Foundation of the Arts Excellence Award and was chosen as one of the 16 Artists To Know in 2019 by Art Patron magazine (California). John Trinh has produced and directed an award-winning documentary titled "Agent Orange: 30 Years Later." A Cityscape - Digital media 48 x 28 in. Wired-Cityscape - Digital media 48 x 36 in. Blue Soul - Digital media 48 x 28 in. Zeev Parush is a self-taught painter, photographer and digital artist from Israel. "After years of creating digital art I was still searching what exactly I wanted to achieve and create in my work. I came across the Belgian surreal artist Rene Magritte. When I first saw his work it was then that I wanted to create scenes of idiotic and unreal places." Award-winning, self-taught digital artist from Liverpool, UK, Philip McKay's art has been exhibited in many art galleries across the world and has adorned book covers for popular authors as well as music album covers. "Photography was my first interest; street and coastal photography were my main subjects. It was in 1996 that I entered the world of digital art after coming across the work of surreal artist Rene Magritte." "My main focus is photography with extreme digital editing processing. This means that I am creating pictures and graphics from architectural, natural and abstract subjects with often surreal components. 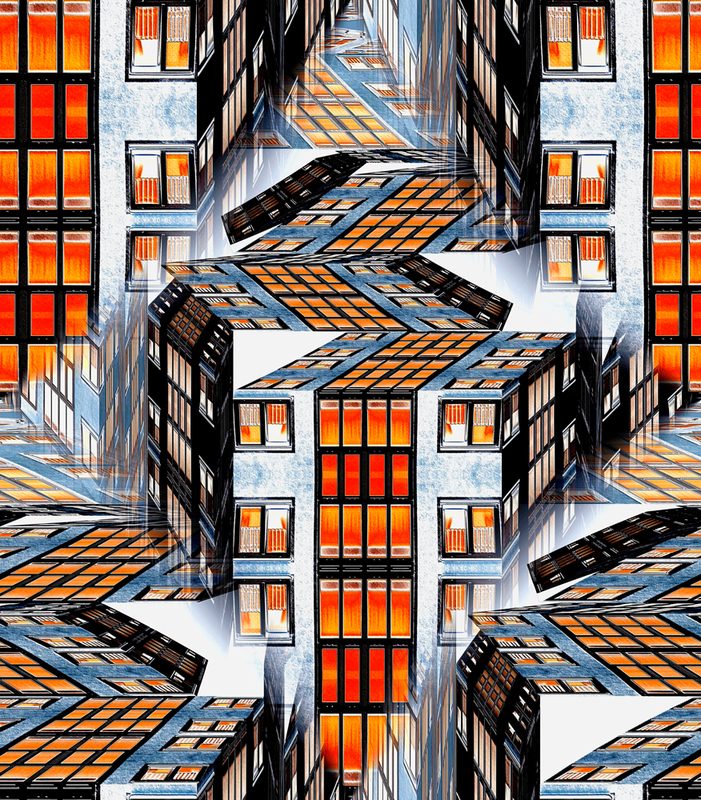 My favorite themes are front facades of modern buildings or parts of them, which I'm digitally editing and finally changing it into an abstract digital creation."